A friend of mine saw a feature on the news that amused him. He told me that, at five foot eight, he was considered "average" height for a man. He said that the story on the news stated that for every inch over the "average height," a male in the workplace could expect to earn an extra $600 each month. Considering that my friend was unemployed, he was happy to hear the good news and reported that he would immediately begin wearing elevated shoes. "Heck, until I find work, I am sure that I can live on $600 a month." This bit of humor betrays a very real and serious problem that effects men and women in the workplace. It's a common problem, but one that is likely to be extremely difficult to eradicate. Much public attention has been given to discrimination based on race, creed, color, national origin and age. But there is a form of discrimination that is still a taboo in the workplace. It is seldom ever addressed, yet it is perhaps the most obvious form of favoritism when it comes to job hiring, promotions and social acceptance -- both on the job and in society in general. Attractive people are significantly more likely to attain elected office. Unattractive people are extremely likely to be passed over for promotions. These and other startling facts are outlined in Steven M. Jeffes new book, Appearance Is Everything. In it, Jeffes takes a close look at some of the reasons behind appearance discrimination, citing tests and demographic surveys that prove his points with convincing and comprehensive data. In Jeffes book we learn that it is not enough to be "average" looking. In fact, in many instances this is just as bad as being "unattractive." Much of the criteria that people use to judge another's health and abilities appears to be a combination of learned behavior and, as the ViewZone's "What Is Beauty" shows, innate preferences. Appearance Is Everything takes a look at the cover stories and features of popular magazines and shows how the themes of "beauty" are strongly reinforced as cultural facts. Jeffes also shows how our concepts of beauty have changed dramatically over the past 100 years, lending fuel to the evidence that culture and media are strong influential factors on what we "see" and what we infer about character from each other's appearance. But hope springs eternal. Jeffes goes one step further. Several chapters in Appearance Is Everything are devoted to strategies that will help you compete in the world of the beautiful, even if you are not. Wearing certain clothes, using certain words and even walking with better posture can improve your chances of being perceived in a more positive light. With Jeffes 45 Appearance Rules you could get a better job or even score a date. But the real importance of his book lies in the revelations of our thin-skinned concept of beauty, which can be of value whether looking at yourself or at other people. Steve Jeffes is currently gathering data in an attempt to seek a revision of the Civil Rights Act of 1964, to include laws against appearance discrimination. Appearance Is Everything is a "must read" for anyone who has experienced this form of injustice -- and really for everyone who has been exposed to this subtle but powerful form of prejudice. Appearance Is Everything ISBN 1-56315-088-3, Sterling House, is available everywhere. Do Good Looks Get High School Students Good Grades? ScienceDaily (Apr. 23, 2009) ó Do personal traits predict success in school? If so, which dimension of one's outward appearance can tell the most about academic achievement? The answers to these questions are found in a new study by researchers from the University of Miami Health Economics Research Group. The study is the first to demonstrate that non-cognitive traits play an important role in the assignment of grades in high school. Economists have examined the role that beauty plays on the type of employment, earnings, productivity and the likelihood of politicians being elected to office, and have wondered if "beauty premiums" and "plainness penalties" in the labor market come from an accumulation of differences in attention and rewards received from teachers throughout the school years. Findings from this peer-reviewed study titled: "Effects of Physical Attractiveness, Personality and Grooming on Academic Performance in High School" will be published in the next issue of Labour Economics. The study offers a new perspective in an area of research that until now was almost exclusively focused on adults. It examines the effect of three personal characteristics--physical attractiveness, personality and grooming--on students' grade point averages (GPA) in high school. The primary objective is to determine which aspects of these non-cognitive personal traits are more strongly linked to academic achievement, said Michael T. French, professor of health economics in the UM College of Arts and Sciences and one of the authors of the study. "Several studies in the literature have found that physical attractiveness is significantly related to labor market earnings for men and women. Thus, we were somewhat surprised to find that physical attractiveness was not the most important non-cognitive predictor of grades," French said. "Instead grooming and personality were stronger predictors of academic success in high school for boys and girls, respectively." Physical attractiveness has a positive effect on GPA for both genders, but only when considered alone. When physical attractiveness is considered along with grooming and personality, the positive effect of physical attractiveness on high school GPA turns negative for both genders. For male students, grooming delivers the biggest overall effect on GPA. For female students, personality is positively related to GPA. Physical appearance can be a way for adolescents to either rebel or accept adult's standards. However, whether the student is a "rebel" or a "conformist" does not have a significant independent effect on GPA. The findings suggest that some degree of teacher bias is present in favor of, or against certain types of students. All else equal, Hispanics and African Americans have lower GPAs than whites and girls have higher GPAs than males. Students living with a mother who attended college, those that live in a two-parent household and those attending a small school have higher GPAs than those in different circumstances. Receiving public assistance is negatively associated with GPA. In conclusion, the study posits that students may be able to "trade-off" different personal characteristics to improve academic achievement and that this trend may affect future success in college, the labor market and family formation. Why Some People Hurt Children -- viewzone looks at the causes and thinking of pedophiles. Why the Somali Are Pirates -- there's another side to this story. After you hear it you just might change your mind about what they are doing. 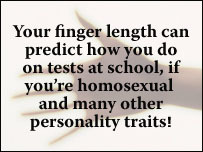 Finger lengths are different for men and women. But this difference can reveal a lot! 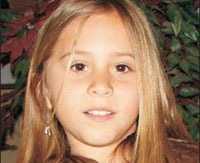 See Casey Anthony's diary and handwriting analysis! Take the Color Preference Personality Test - It's FREE! Instant results.